Simonis Fertilizers B.V. exports, produces and develops high quality organic fertilizers, particularly animal manure. Stimulating the growth of soil microbes. Besides these functions, organic matter increases the crop yield, particularly on poor soils. This effect we call the “plus factor”. Research in The Netherlands proved that a combined use of mineral fertilizer and organic fertilizer will increase the crop yield by 3-5 %. Fertilizing with only mineral fertilizers will give hardly any improvement in the productivity. This product is dried and pressed into a tenable manageable pellet of 5 mm average diameter. The result is an environmentally-friendly fertilizer, branded as WOPROFERT® and AGROGOLD®. Both brands are quite similar and are organic fertilizers of a good quality suitable for farms, gardens and other companies. 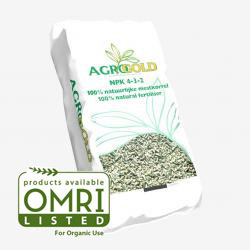 Our AGROGOLD® brand is OMRI Listed, and therefore a verified product suited for organic farms and gardens. WOPROFERT® is analyzed regularly by the official STER Laboratory in the Netherlands. * There where not explicitly mentioned, the technical data for both brands “WOPROFERT®” and “AGROGOLD®” are to be considered similar. An organic fertilizer is a slow-release fertilizer. This means that the nutrients will be available/released over a period of time. Research has shown that the release of nitrogen in the first year is 60% , phosphate 80% and potassium and magnesium is 100 %. The rest of the percentage is available during the next year. To fertilize your crop in an economic and environmentally sound manner it is desirable to analyze the soil and match the fertilizing process to the needs of the crop. It is important to take into account, the period, the quantity and method of fertilizing. WOPROFERT® / AGROGOLD® is a product with two functions: at first it supplies the needs of nutrient requirements of your crop and secondly it improves the soil structure. Based on soil analysis, crop needs and experience, it is possible to apply an amount of WOPROFERT® / AGROGOLD® suitable for your conditions. If you use WOPROFERT® / AGROGOLD® only as a soil improving fertilizer, you have to be aware not to use too much. WOPROFERT® / AGROGOLD® organic fertilizer can be strewn with existing machinery. WOPROFERT® / AGROGOLD® organic fertilizer dissolves in about 3-5 minutes. In practice WOPROFERT® / AGROGOLD® organic fertilizer will dissolve after one shower of rain. The time taken for a pellet structure to break down is depending on the amount of rainfall. Any discussion of fertilizers should begin with at least a brief overview of plant nutrition. Primary nutrients, secondary nutrients, trace elements and Organic. Primary nutrients : Nitrogen, Phosphorous and Potassium. Secondary nutrients : Calcium, Magnesium and Sulphate. Trace elements : Zinc, Iron, Manganese, Copper, Boron, Molybdenum, Cobalt, Sodium and Chlorine. All these nutrients work together in a delicate balance to promote plant growth. For example, an excess of one nutrient can reduce a plant’s ability to absorb another. The role of any fertilizer is to improve the fertility of the soil. The soil supports plant life and is the vehicle that supplies the necessary nutrients to the plant. The more fertile a soil is (i.e. rich in organic matter) the more likely it is to yield a healthy and abundant garden. Organic gardening starts with adding organic products to the soil. Organic fertilizers feed the soil, not the plant. The soil will feed the plant. Organic fertilizers help maintain overall soil fertility by contributing vital organic matter and enhancing the soil structure in addition to supplying plant nutrients. They are most often derived from the by-products of once living organisms. The product that supplies most of the nutrients in organic fertilizers is, among others, animal manure containing about 65% organic matter. Our Organic Fertilizer, based on animal manure, is certified by the Ministry of Agriculture, Nature and Food Quality / Netherlands Food and Consumer Product Safety Authority (NVWA) and each or their ingredients are periodically tested to ensure that they meet the highest standards. Besides WOPROFERT® an AGROGOLD® organic fertilizers, we have the possibility in our production process to mix any composition you want, based on organic- or inorganic products. These special products, we only produce upon request of a minimum quantity of 100M/tons. We will be pleased to give you further information and at your request, calculate the required composition. The average ratio between Carbon and Nitrogen in “WOPROFERT®” is 8. For “AGROGOLD®” this is 9. The average pH of both “WOPROFERT®” and “AGROGOLD®” organic fertilizer is 7. WOPROFERT® / AGROGOLD® organic fertilizer works neutral in the soil. The acid binding capacity is + 2. WOPROFERT® / AGROGOLD® organic fertilizer is low in Chlorine. The level of Chlorine is less than 0,5%. WOPROFERT® / AGROGOLD® organic fertilizer contains 10 non-pathogenic bacteria per gram product. WOPROFERT® / AGROGOLD® organic fertilizer is free of animal- and vegetable pathogens, because of the specific production process. A Veterinary Certificate can be made available by request. The unique process guarantees a weed-free product. 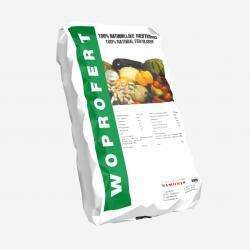 The density of “WOPROFERT®” is 600 kg/m3 ( = 0,6), for “AGROGOLD®” this is 700 kg/m3 ( = 0,7). The average pellet length of WOPROFERT® / AGROGOLD® organic fertilizer is 5 to 8 mm. The average diameter of the pellet is 5 mm. WOPROFERT® / AGROGOLD® organic fertilizer can be supplied in strong polyethylene bags of 10 kg, 15 kg, 25 kg or 50 kg, in Big Bags of various net weights and in bulk.